This is a remarkable performance in a market that has fallen by more than 80 per cent due to the current economic recession. 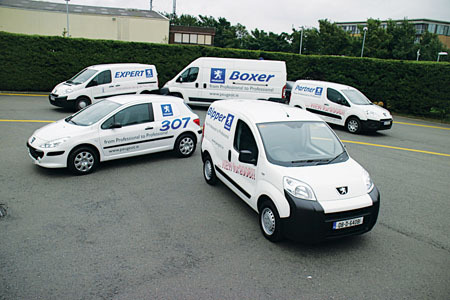 The Peugeot van range has won numerous prestigious awards, including Irish Van of the Year 2009 for the Peugeot Partner and Irish Commercial SUV of the Year 2009 for the 4007 Commercial. The Peugeot Bipper, the first van designed for the city, won International Van of the Year 2009 with its stablemate, the Peugeot Expert, winning this same award for 2008. The new Bipper also does its part to help minimise the carbon footprint with CO2 emissions from 117g/km. Peugeot’s range of commercials feature additional, optional specification designed for the business user, including: air conditioning, a full steel bulkhead with an in-cab tunnel section for the carriage of extra long items, and a hands-free Bluetooth phone kit.